However, there is a caveat. We demonstrate that it is possible, at least in theory, for the magnetic and the plasma pressure gradient restoring forces to balance in such as way that a wave in an asymmetric waveguide can appear symmetric (i.e. the oscillations on each side of the slab are of equal amplitude). We call this deceptive type of wave "quasi-symmetric". The existence of quasi-symmetric waves means that we cannot assume waveguide symmetry even when we observe symmetric waves. Access our open-access publication here. 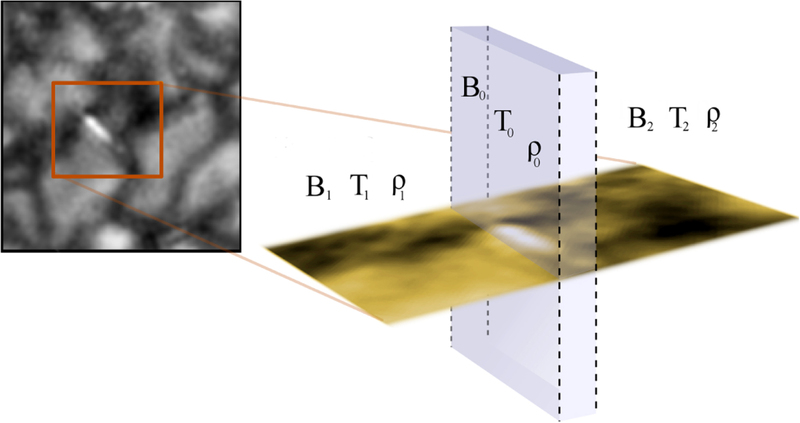 Figure: An elongated magnetic bright point is considered as an asymmetric magnetic slab (Based on Liu et al. 2018).